Booo! This collection is hilarious. Wherefore art thou, my beloved The Best of the Super Mario Bros.? 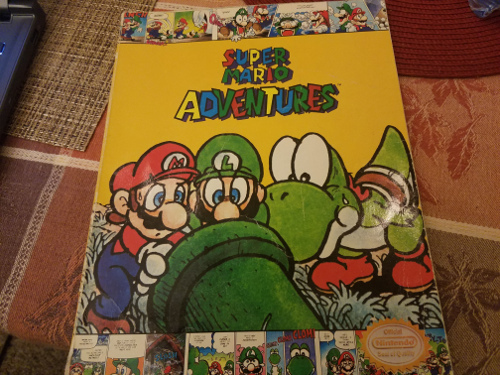 While the The Best of the Super Mario Bros. strips are focused on random comedy (and does a fine job of it I might add), Super Mario Adventures is essentially a Mario game in comic form. It’s not an origin story or a collection of different (mis)adventures, so if that’s what you would like to have seen, sorry. Originally serialized in Nintendo Power, Super Mario Adventures features the traditional setup: Bowser wrecks havoc, and Mario and Luigi set out on a journey to defeat him. The book clocks in around 110 pages with the last chapter being a side story dedicated to Mario’s rival. He wasn’t even in the main story, so I’m guessing this was a setup for a new arc that was never created. Besides the brothers and the main villain, we see several other major and recurring characters: Princess [Peach] Toadstool, Toad (is he even named? ), Yoshi, and the Koopalings. Lots of familiar enemies show up to raid the Mushroom Kingdom like Lakitu and Boos, but where are all the Shy Guys? (Too shy to appear in this comic?) With so many different creatures and beings in their way, it’s no wonder why Mario and Luigi have to take the long way back to the castle each time. A few new characters like Floyd the salesman are introduced. His business ventures are the biggest running gag in the story. While the comic is not solely a comedy, the action is on the light side. If you want to see Mario and Luigi constantly slug it out against the Koopas or try to use their enemies as weapons, then you’re going to be disappointed. Yoshi defeats more enemies than anybody. By a long shot. Mario doesn’t even get fire powers or anything. That’s disappointing. However, if you want to see the brothers use Hanna-Barbera techniques to escape a giant Boo, you’re in luck! The bonus comic goes even further and makes Wario and Mario a Looney Tunes-type duo where one is a clueless idiot and the other the vengeful rival. And while Bowser sometimes is presented as just wanting to marry the princess to get the kingdom, he definitely wants to marry her in Super Mario Adventures. Fortunately, though, the story never loses the Mario-ness of the tale. It tries to add to the game lore without forgetting why Mario is popular in the first place. Luigi is more of a cowardly idiot, but Princess Toadstool is pretty proactive, literally jumping head-first into action. (Fortunately, her servants are quick to have a safety net ready.) She really is the standout here. (Well, her and the killing machine known as Yoshi.) She reminded me of Barbie in Toy Story 3: pretty but fights against the dumb blonde stereotype. These kind of additions in the story keep Super Mario Adventures from being exclusively for young readers. The Koopalings may assist their father, but they sure as heck aren’t impressed with their father’s trap. A few game jokes don’t hurt either; Dr. Mario, for instance, makes an appearance. A few things even seem funnier in hindsight (other galaxies anyone?). The art also deserves a lot of credit for being an Eastern-style comic that is still accessible to Westerners. Nozawa is a manga artist, and you can definitely see some standard manga poses and layouts. Princess Toadstool even does the Official Ojou-sama Ohoho laugh: You can still see some American comic influences like having a big chase scene in one large panel, but I was surprised at how much manga influences there are. Sure, a lot of American comics use similar techniques, but the blushes and the anger marks are all Japanese. One time characters even go full-blown anime happy eyes as they set out together. In addition, Super Mario Adventures was published monthly, and this gave Nozawa plenty of time to add a lot of flourishes to each installment. A reader could easily miss the Koopalings’ expression when Bowser talks about how well he’s raised them, but the looks on their faces says it all. The comic is in full color, and it has that pastel crayon-like quality to it. It almost looks as if it has been lifted directly from the old Mario game boxes and manuals. Well, except Floyd. He has a more realistic look to him, and I’m guessing he’s supposed to be a parody of someone? No idea who though. Anybody know? The oversized physical version also helps make the colors pop out, and while the pages look thin, it’s actually some pretty high quality gloss. If anything, Super Mario Adventures feels like a detailed storyboard of a Super Mario Bros. movie. … Make that a good version of a Super Mario Bros. movie. If you are the type who would buy a G-rated animated Mario movie (or know someone who does), then Super Mario Adventures fills the void perfectly. I don’t think it’s funny as the The Best of the Super. Mario Bros., but this does have an actual running storyline and features Bowser more looking like his game self. Plus as a manga fan, I like the art in Super Mario Adventures better. By the way, Koopalings >>>>>>>>>>>>>>> Bowser Jr. I really enjoy this comic, both back in Nintendo Power and in graphic novel form. I think the full color goes a long way in making this Eastern comic appealing to Western audiences, in addition to Nozawa’s artstyle, of course. I wouldn’t mind a cartoon or movie version of Super Mario Adventures. It’s like a better version of the actual cartoon, which I liked… The characters have so much more personality than in most Mario games. Toadstool even gets to have some fun. And I agree that Koopalings > Bowser Jr! That Best of the Super Mario Bros. looks interesting though! I don’t think I’ve ever seen that. Yeah, The Best of the Super Mario Bros. seems to be rare-ish, which is too bad. If Super Mario Adventures was made into a movie, some of the strips from Best would make good “before the movie” cartoons. And yay, a fellow Koopalings fan! Mario shorts would be awesome! We have Pikmin and Yoshi shorts. Let’s get some modern Mario animated shorts! And yes, the Koopalings are great! I’m so happy they’re in games again after a break. For them to be in Smash and Mario Kart now makes me happy too. If poor Bowser can’t get Peach to marry him maybe he can settle for Luigi in a dress? Yeah this was a fun Mario comic. I’m definitely hoping they re release the other comic that you mentioned since it looks like a blast. In general, I’m surprised that we don’t have more merchandise here like the Super Mario Kun series. I figure that would sell really well since Mario’s so popular. I do hope it’s reprinted. I think you would like it. Enemies team up, not-so-anonymous advice columns, and more. I was really amazed when I saw this review here. I must have read this comic a hundred times. I got the book from a yard sale actually, and I found the art so compelling. I think it was before I ever saw a proper manga, but even then I thought it was amazing. It helped that I was really into Mario at the time, so seeing all these characters was extra charming. I also thought it was great that Peach was so heroic while Mario and Luigi fumbled around. That’s so neat! Do you still have your original copy? Peach here made me really wish this duo would do a Super Princess Peach comic. Really liked the sort of relaxed tone for this review. Suited well for the material. Toad’s name is Toad, but it is also the name of the species. You could say Toad is the Toad that all other Toads embody, as he is the original Toad that all Toads are named, perhaps as a badge of honor. I was thinking he had another name before Toad became official, like the switch between Peach/Toadstool, Koopa Kids/Koopalings, etc. Hard to keep all the different universes straight. But here I think he’s just called “hey you”. Poor Toad.